I heart Eddie Ross. Seriously, this guy is AMAZING. I just saw his most recent post and had to share it with you. I think so many of us struggle to find ways to make store-bought furniture our own (and unique) and this is a great example of how to do just that. This is great timing too since I am having such a hard time finding an inexpensive bookshelf for my mom's home office. I'm thinking this DIY project might just be in the cards. 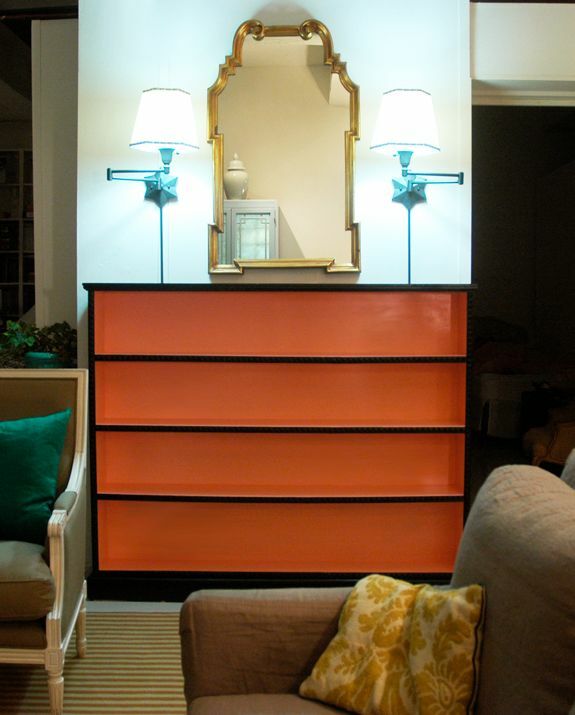 Check out how he turned a Billy bookcase from Ikea into something fresh and fun. I especially like the fabric he chose for this DIY project. And while I read his post, my memory was jogged from when I had read another amazing blogger's own revamp of a bookshelf. Jenny, from Little Green Notebook, took a somewhat blah bookshelf and turned it into something Dorothy Draper would be proud of. And if you didn't already know, this girl rocks when it comes to DIY projects. Definitely check out her site to see more of her incredible projects. Happy Friday everyone! Have a great Memorial Day weekend! ginormous thank you for posting this! my husband brought a boring black billy into our marriage and I've been secretly plotting it's demise until I saw this post. I guess I can do something with it after all. @Kathysue - He is truly an inspiration! Everything he does, I want to try my hand at cause he makes it look so good! @Kae - You're quite welcome! I was more than happy to share :) I love DIY projects, especially ones that are easy to do like this one that create such an impact.